The Girl picked out her own outfit this morning, accessories and all. She's my little tiger fairy today and has worn both wings and ears out and about all morning. 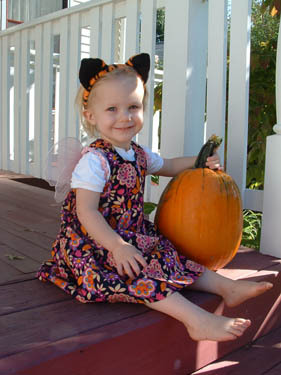 She's sitting next to a pumpkin that grew in our backyard. We hadn't intended to grow pumpkins in the garden, but several gourd-like vines started volunteering last Spring and I let one live to see what it was. The pumpkin was really a few days away from being ready for picking, but our dog decided it was a ball this morning and "picked" it all by himself. I removed it to the front of the house for safe keeping, before he started gnawing on it. That is just about the sweetest picture I have ever seen. Give her a big hug from me--although it would probably be best if you didn't say it came from a possum. Cute kid. You'll never be able to deny that face. Lady looks just like her mama. By the way, what does she think about having a little brother or sister? Those sweet smiles help remind us why we tolerate the not-so-good misbehavin' times. Thanks for the picture - it brightened up my day. She's a cutie. Just pray she doesn't try to dress like that when she's ten.